Once Caldas football club achieved international recognition on 1st July 2004 when they became only the second Colombian team to win the Copa Libertadores (Latin America's Champions League). They first won a domestic title back in 1950 when they went by the name Deportes Caldas. But it would be another 53 years until the club would again be crowned champions of Colombia. In the first season of 2003 "El Once" defeated Junior of Barranquilla over the two-legged final to claim the championship and also qualify for the 2004 Copa Libertadores. The 2004 Copa Libertadores was only the third time in the club’s history that they had participated in the tournament. The Manizales club qualified from Group 2 in first position 5 points clear of UA Maracaibo in second place. El Once faced Ecuadorian side Barcelona in the second round. After a 0-0 and 1-1 draws in the first and second legs respectively the tie went to penalties, El Once overcoming their rivals 4-2. 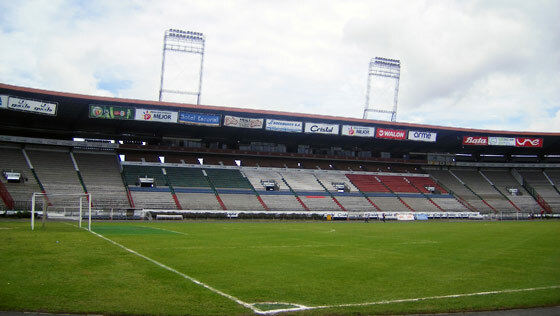 The Manizales club then faced Brazilian club Santos in the quarter finals. The away leg ended in a 0-0 draw, but in the return leg in Manizales El Once defeated the Brazilian side 1-0 courtesy of a goal from Arnulfo Valentierra. In the semi-final El Once would again face Brazilian opposition, this time in the form of Sao Paulo who included the tournament’s top scorer Luis Fabiano. The first leg once again ended in a goalless draw. The second leg, played in a Manizales was level at 1-1 and heading to penalties when Jorge Agudelo scored in the last minute of normal time to send El Once into the final. Once Caldas’ rivals in the final would be Boca Juniors, who had disposed of rivals River Plate in a fierce all-Argentinian semi-final. The first leg was played in La Bombonera and finished 0-0. The return leg ended 1-1 after normal time after goals from Jhon Viafara (O Caldas) and Nicolas Burdisso (B Juniors). The final would be decided from the penalty spot. Boca Juniors incredibly missed every one of their 4 penalty kicks. El Once, despite missing two spot kicks themselves, scored twice to claim the Copa Libertadores and send a packed Estadio Palogrande delirious. As is so often the case in south american football the nucleus of that successful squad was sold the following season and for several years struggled to follow up that success with more silverware. However, that slight dry spell came to an end in the first half of 2009 as they were crowned Colombian champions after defeating Junior in the final in a repeat of the 2003 final. The following year El Once won their fourth title after beating Deportes Tolima in the final of the second season of 2010. Once Caldas play their home matches at the Estadio Palogrande near the Zona Rosa district in the east of the city. See my guide to Colombian football stadiums. For information about the city of Manizales in which Once Caldas play, click here.